October 3, 2018 – Today, at the International Astronautical Congress (IAC) in Bremen, Germany, Lockheed Martin experts revealed the company’s crewed lunar lander concept and showed how the reusable lander aligns with NASA’s lunar Gateway and future Mars missions. The crewed lunar lander is a single stage, fully reusable system that incorporates flight-proven technologies and systems from NASA’s Orion spacecraft. In its initial configuration, the lander would accommodate a crew of four and 2,000 lbs. of cargo payload on the surface for up to two weeks before returning to the Gateway without refueling on the surface. The unique orbit of the lunar Gateway provides global lunar access for a lander. 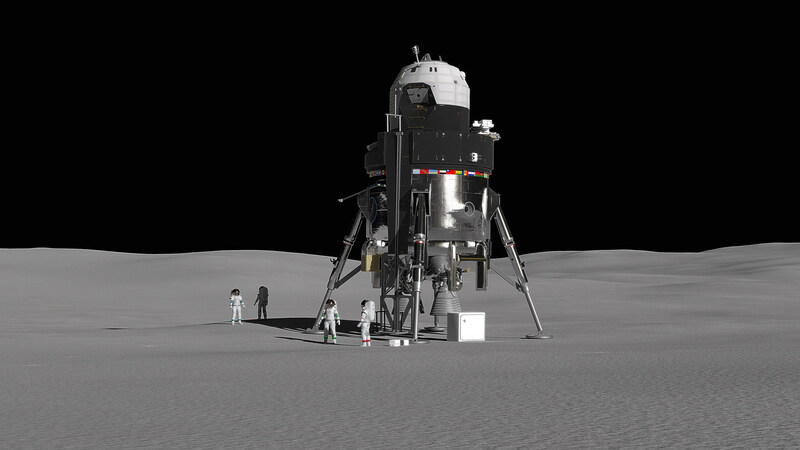 Having the ability to visit multiple sites with a reusable lander supports many international, commercial, and scientific communities, in addition to NASA’s sustainable exploration of the Moon. After a surface mission, it would return to the Gateway, where it can be refueled, serviced, and then kept in orbit until the next surface sortie mission. The investments made in technology developed for Orion can be re-used to reduce the cost, complexity and development timeline. Some of the human-rated, flight-proven systems used in the design include avionics, life support, communications and navigation systems, and a light-weight version of its crew module pressure vessel. Reusable landers are enabled by the lunar Gateway and are important for sustainable exploration. Additionally, landed human lunar missions and a lunar orbiting outpost are valuable to prepare for sending humans to Mars. While the Moon doesn’t have an atmosphere, there are still many lessons that apply to a future crewed Mars lander, such as: operations experience in a challenging and dynamic environment, operating and refueling out of orbit, long-duration cryogenic propulsion, and terminal descent navigation, guidance and control.